M2 Mixers are the standard Marki triple balanced mixers. As detailed in the Mixer Basics Primer, a triple balanced mixer can have overlapping LO, RF, and IF bands. Additionally the IF bandwidth peaks at higher frequencies, and does not have the roll-off characteristic of a double balanced mixer. 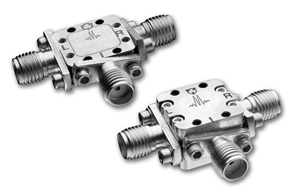 M2 mixers offer outstanding broadband operation from MHz frequencies to 50 GHz.